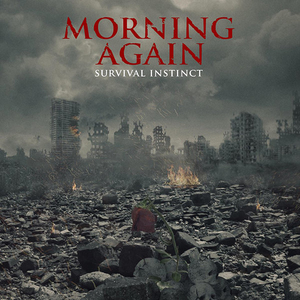 Morning Again - Survival Instinct - col 7"
4 neue Songs!!! Graues Vinyl! For the first time in over 20 years, MORNING AGAIN returns with their Survival Instinct 7" EP, offering up four brand-new tracks. The lineup still consists of vocalist Kevin Byers, guitarists John Wylie and Stephen Looker, and bassist Gerardo Villarroel. Now, they are also joined by Joshua Williams (formerly of CULTURE) on drums. Coincidentally before the band initially dissolved, they released their final full-length record As Tradition Dies Slowly in 1998, also on Revelation Records. When the idea of recording new material came up, it was unanimous on both sides to return where the music fit. The record was tracked in California with producer Beau Burchell, who has recorded the likes of SAOSIN, MOOSEBLOOD, THE BRONX and countless others. Band founder and guitarist John Wylie says "The time is right for new MORNING AGAIN music. When we started playing one-off shows and festivals again in 2011, we realized not only do we have more material left in us; there seems to be a demand for it." The band is set to play select shows across the US, Europe, and Japan in 2019, including at FYA fest in Tampa in January, to accompany the release of their new music. Wylie goes on to say "We feel these are four of the best and strongest songs we have ever written and we are very excited to be able to present them with modern day recording capabilities, something we weren't exposed to in our early years."